Sells Rowan yarns and a selection of fabrics, along with loads of other homewares. They specialise in Liberty print cotton. Their lace and braid section is well worth a look. Also do stranded cotton and many tapestry kits. The Rowanettes knitting group meets here. It has many other departments, including a good selection of (rather high-end) fashion, homewares, furniture and fittings. It also has an antiques and collectables department in the basement, with some very desirable collectors' items from many different eras. 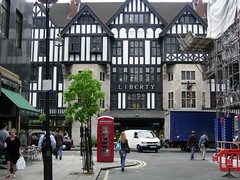 Throughout the store, prices are noticeably higher than regular high street department stores. As with John Lewis, some people think Liberty is not what it once was. They do, however, have a very definite sense of style leaning heavily on the store's origins in the trade of precious items from the Orient, as well as its later links with the Pre-Raphaelite movement in painting and the arts. This is reflected in much of what they sell, and is needless to say not to everyone's taste. Last visited by Kake and doop, late-2006. Opening times taken from the Liberty website, April 2007. Last edited 2018-09-08 20:29:35 (version 14; diff). List all versions. Page last edited 2018-09-08 20:29:35 (version 14).